It was 9:00 on Sunday morning, and I needed to have a potluck dish ready by 10:30. 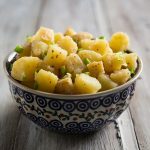 To complicate matters, I had little desire to cook or even to attend the potluck–I was thoroughly immersed in a mystery novel and could have happily stayed curled up in the recliner with it all day. Nevertheless, I am a mother and a realist, and I knew I’d eventually have to get up and pretend to be a productive member of society. So at a very late hour, I started looking for something to cook. Potlucks are often not very lucky for vegans and vegetarians. In order to make sure there’s something my family can actually eat, I always try to bring a main dish rather than a side dish or dessert, and a main dish that contains several of the major food groups is even better. I decided that I needed a “one-pot meal” sort of dish that contained beans, vegetables, and grain, though with time running out, there just wasn’t enough time to cook a grain. So I opted instead for couscous, a tiny pasta that works like a grain in many dishes but cooks many times faster than even the smallest of grains . 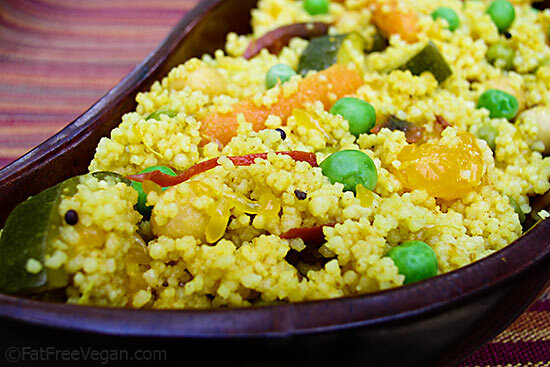 I had in mind to make some kind of curried couscous salad, and just for fun I decided to check and see if the always-inventive cooks at the (now-defunct) Naughty Curry blog had done anything with couscous. And of course they had! Their Pineapple-Paradise Couscous Curry looked to-drool-for, and I promise you, I would have made it just as it was written except for one big problem: I didn’t have any pineapple. But I did have a can of mandarin oranges, so I made a few changes in the recipe but left the spicing pretty much as the Naughty cooks had made it. And it was wonderful–lightly sweet, richly spiced, and delicious hot or cold. Thanks, Trobee and Courtney, for the inspiration. Heat a large, non-stick wok or dutch oven, and give it a quick spray of oil. Add the black mustard seeds, chilies, and cinnamon stick. Cook and stir until the mustard seeds begin to pop or until fragrant (without much oil, seeds may not pop, but that’s okay). Add onions, garlic, ginger paste, and masala. Sauté until fragrant, about 2-3 minutes, but be careful not to burn it. Add the orange juice and bring to a boil. Add the zucchini and carrots, cover, and cook for 4 minutes. Add the green peas and chickpeas, and cook until heated through, about 3 or 4 minutes. Add the salt, couscous, mandarin oranges, and hot water. Stir well, cover, and remove from heat. Allow it to sit for at least five minutes before stirring. 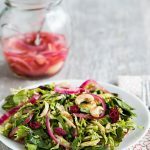 Serve hot or at room temperature or chill for a fantastic salad. Nutrition (per serving, with salt): 315 calories, 19 calories from fat, 2.3g total fat, 0mg cholesterol, 462.8mg sodium, 679mg potassium, 63.1g carbohydrates, 8.9g fiber, 14.3g sugar, 11.5g protein (without salt, sodium is 75mg). 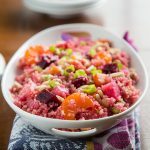 This is one of the best couscous salads I have ever tasted; it’s sweet and full of good spices, and it’s really great cold! I LOVE LOVE LOVE it and so do all my nonvegetarian friends. I thank you so much Susan for sharing it and making me discover it! 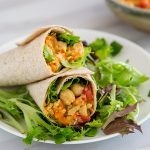 I enjoy your site a lot, it is a true inspiration for cooking creatively healthy food – showing everyone that eating healthy can be oh so delicious! I didn’t have mandarin oranges or pineapple, but I did have a can of apricot halves, so am giving that a go. Just waiting for the couscous to cook now, but it smells so delightful, I’m actually looking forward to lunch tomorrow. Oh, and I had to use orange/carrot juice instead of just orange. Fingers crossed! What happens to the spices flavoring without the oil? Is there any sub for the oil that might work?? You can try toasting the spices without oil, but in my experience, they become bitter. You can try using less oil–I’ve managed with even 1/8 of a teaspoon–or just get used to the taste of the toasted spices. This sounds amazing by the way! I would say that this serves 6 as a side dish, or as one part of a potluck. I hope you’ll give it a try! Thank you Susan!! 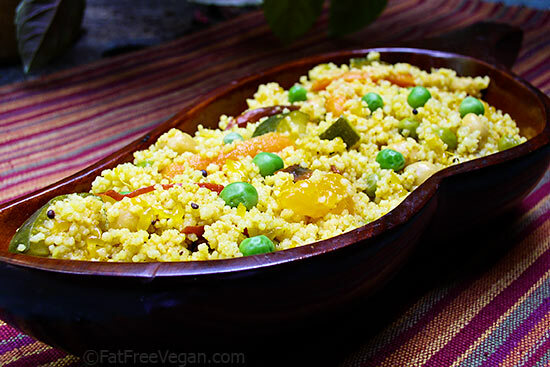 I just made this couscous salad and it is W-O-N-D-E-R-F-U-L.
I’m having it warm tonight for dinner and bringing the rest tomorrow as cold salad for a picnic potluck! Love your website! Where can I find green cardamom pods and black mustard seeds? The best place (with the lowest prices) is at an Indian grocery store. You may also be able to find them in the spice section of larger grocery stores (especially the mustard seeds), but if neither of these options is available, you can order them online. I use The Spice House a lot for spices I can’t get locally. I just started my walk in to the vegetarian/vegan world, could you please tell me which are the basic of herbs and spices that I should have in my kitchen? I love your site everything looks so delicious. Great to bring as a lunch to work. Maybe my favorite recipe so far! Thank you very much! Don’t have ginger paste. Would I make my own ginger paste in my food processor by combining fresh ginger with a little water? I would just use 2 teaspoons of minced ginger, PatB. That will be much easier.